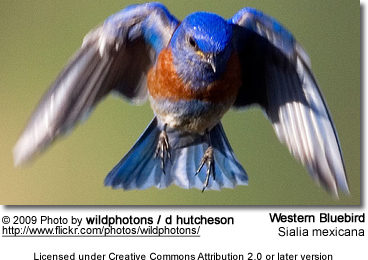 The Western Bluebirds or Mexican Bluebirds (Sialia mexicana mexicana) occur naturally in Northern America. They are the western counterparts of the more familiar Eastern Bluebirds. During the breeding season, these bluebirds are typically seen in pairs or small family groups; however, for the rest of the year, these social birds often join large mixed feeding flocks with 100 birds or more. These flocks may include the related Mountain Bluebirds (with which they are known to hybridize), American Robins and Yellow-rumped Warblers, and other birds with similar feeding habits. When temperatures drop, these birds often use communal roost cavities, such as bird roost boxes, where groups of birds share the same space in order to keep warm. During the day, these birds are most commonly seen perching on fence posts, signs or prominent limps as the scan the ground for insect prey. 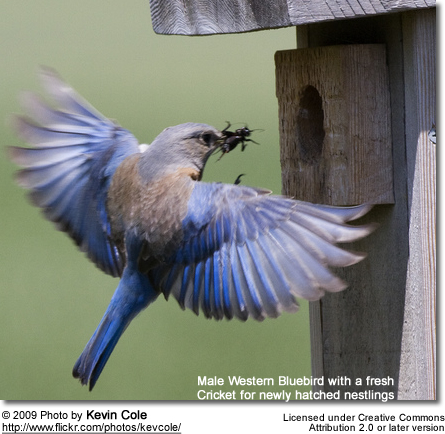 Nesting Western Bluebirds maintain breeding and feeding territories, and will aggressively defend those. In flight, they may grab the opponent's legs, and the two birds will tumble to the ground where the fight continues. Males have been seen pinning intruding birds on the ground and jabbing them with their bills. Western Bluebirds are found in parts of western North America, with a range that stretches from southeastern British Columbia and Alberta in Canada, south into the United States, where they occur in Washington, Idaho, western and south-central Montana, Nevada, Utah, Colorado, west Texas, New Mexico, Arizona and California. They range south into northern Baja California and into central Mexican states of Michoacan, Puebla and central Veracruz. Northern populations migrate south for the winter and those found in southern parts of the range are often resident (non-migratory), except for some seasonal altitudinal movements. Migrating birds are thought to follow their regular foraging routes. Range: Central Mexico from Veracruz to northern Puebla and Hidalgo, west to Michoacán and Aguascalientes. (Sialia mexicana mexicana [australis] - Nelson, 1903) - Proposed race. Not universally recognized. Range: Southern plateau of Mexico, from Jalisco to Morelos, Puebla and Veracruz. Range: Southwestern Canada - from southern British Columbia south to western Nevada and southern California to northern Baja California in northwestern Mexico. Range: Mountains of northern Baja California in Sierra Juárez and San Pedro Mártir. Range: Davis Mountains in southern Texas (southern USA) and the San Luis Mountains in northeastern Mexico. Range: Northeastern and central Mexico in northern Coahuila to western San Luis Potosí, northern Guanajuato and northeastern Jalisco. Juveniles have a mostly brown-grey plumage with heavy white or buff spotting. There is a blue wash on the wings and tail. As they grow older, the blue color becomes more prominent and the spotting disappears. The male Mountain Bluebird has an all-blue plumage that is lighter both above and below. The female is greyer overall and either lacks the rusty wash on the grey chest or these markings are greatly reduced. The bill is slimmer than that of the Western Bluebird. Male Eastern Bluebirds have rusty-orange throats (white in the females); the abdomen is white and the male's back is entirely blue. 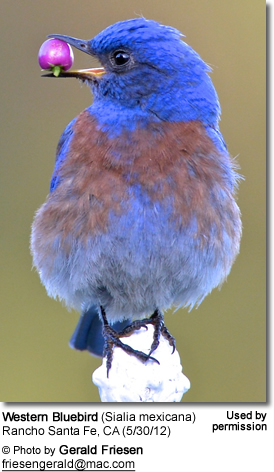 The Western Bluebirds have more extensive blue coloration. 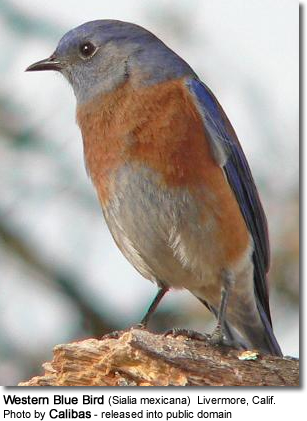 The Eastern Bluebirds occur in eastern USA and the Western Bluebird in western USA, with only a small overlap. Male Lazuli Buntings are smaller than Western Bluebirds. They have prominent white wingbars and thick bills (indicative of its seed-eating habits). The Western Scrub-Jays and Steller’s Jay could only be confused with the Bluebirds because of their blue plumage details; but the plumage is differently patterned; the jays are much larger and noisier, and have longer tails, heavier bills and lack any rusty-orangy coloration. 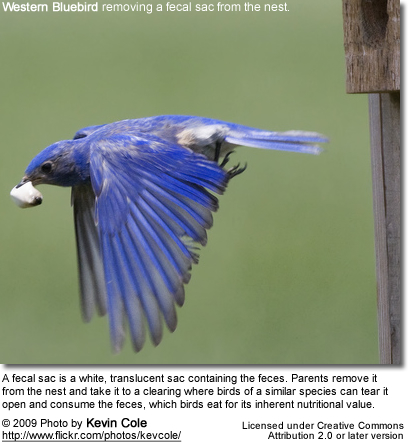 During the spring and summer months, adult bluebirds mostly feed on insects and other invertebrates, including spiders, flies, crickets, grasshoppers, bees, wasps, sowbugs, beetles, termites, snails, worms, caterpillars, ants and pillbugs. These "perch-foragers" look for prey from perches and then drop down on the ground to capture them and return to their perch to feed. They will also catch insects in flight. Animal foods (insects, etc.) make up about 82% of their total diet. These insect-eating birds are helpful in controlling insect populations without the use of toxic pesticides. During the winter - when insects are less available - their diet is primarily made up of wild fruit, plants, such as mistletoe berries (Phoradendron) and elderberries (Sambucus ssp), which are their main winter food items. They will also take blackberries, bayberries, pokeberries, cherries, raspberries, honeysuckle, dogwood, red cedar, wild grapes and figs. They will supplement their plant-based diet with insects, as available. To a lesser degree, they will feed on seeds and grain, which are not part of their typical diet. Nestlings are fed: various insects, including grasshoppers, crickets, caterpillars, beetles, bugs and spiders. Outside the breeding season, these social birds may be seen foraging in flocks. Most breeding occurs between May to July. 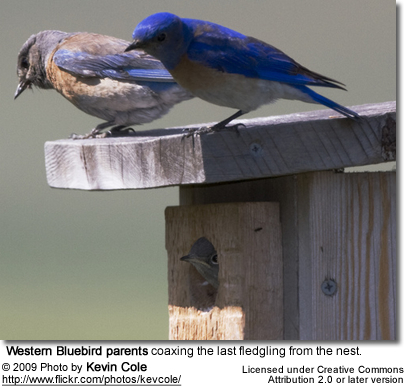 Western Bluebirds are monogamous, although instances of extra-pair copulation are regularly reported. In fact, according to genetic studies, as much as 45 percent of all nests contain one or more chicks that are not the resident males' offspring. They are also co-operative breeders, which means that birds other than the parents help raise the young. These are often referred to as "nest helpers." These can be the independent young from prior clutches, adult pairs, or often other unmated adult males. There have also been reports of birds of different species helping them. For example, Violet-green Swallows have been seen feeding the young and defending the nests of Western Bluebirds. On the onset of the breeding season, the male will perform a courtship display that include exaggerated flights and offering food to potential females. Once a pair bond has been made, the pair will search for a nest site together. These cavity nesters will inspect holes in trees, which often are abandoned woodpecker nests. They will also nest in dirt banks and hollow fence posts. In some instances, they have made their nests in mail boxes or in protected areas in buildings / structures. If available, they may also take advantage of artificial bird houses. Nests are usually 2 - 50 feet (0.6 - 15 meters) above the ground. Once a suitable site has been identified, both the male and the female will construct a nest using grasses, weeds, roots, twigs, pine needles and other material found in their environment. The average clutch size consists of 2 -8 eggs (typically 4 or 5). 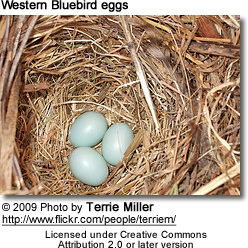 The smooth, oval eggs range in color from a pale blue to bluish white or sometimes are entirely white. Each egg measures about 0.6 - 0.8 inches (16.2 - 20.8 mm) and has a smooth and glossy shell. The female alone incubates the eggs for 12 - 18 days (most often 14). The male guards the nest and takes food to the brooding female. The pink hatchlings are only covered with a sparse grey down. They are blind and helpless. Both parents raise the chicks. The young fledge when they are about 18 to 25 days old, but their parents continue to feed them for up 30 days after hatching. As soon as the first brood has fledged, the female will typically start on the next clutch. She may produce up to three broods in a year if conditions are favorable. Calls:" Kew-kew" and "Che-check", often repeated several times. 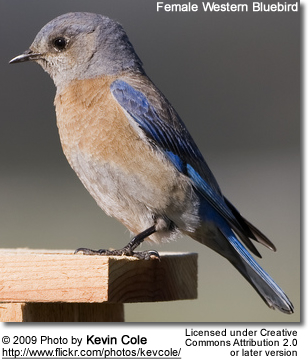 The oldest known Western Bluebird was 8 years and 8 months old. However, most birds don't make it through the first year due to harsh environmental conditions during the nesting period to some extent, but primarily they fall victim to predators, such as cats, chipmunks, squirrels, deer mice, raccoons, and larger birds. They reach reproductive age when they are about one year old. Competition for nesting cavities and food with other, more aggressive birds, such as swallows, sparrows, starlings, wrens, woodpeckers and flycatchers. House sparrows, in particular, are known for attacking Western Bluebirds for their nests, either alone or in groups. Destruction of their natural habitat: These forest-living species rely on suitable trees for nesting. However, increased logging, the suppression of natural forest fires and the removal of dead trees has led to a reduction in suitable nesting sites. Artificial Bluebird Nesting Boxes: Bluebird trails were successfully organized during which lines of bluebird houses were put up, monitored and maintained by conservation groups as well as by concerned citizens. 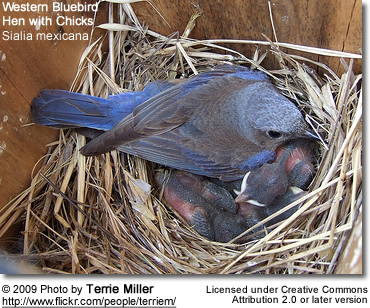 It was found that Western Bluebirds more successfully raised chicks in nest boxes than in natural cavities. Breeding pairs are able to start nesting earlier and the predation rates on the eggs and chicks is generally lower; hence resulting in more young surviving to fledging. Please Note: The articles or images on this page are the sole property of the authors or photographers. Please contact them directly with respect to any copyright or licensing questions.